← The Secret Island – How has Blyton’s original text fared in a modern edition? 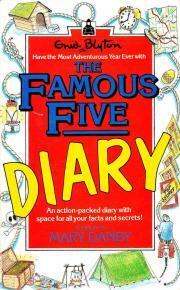 My blog for this week will be looking at The Famous Five Diary by Mary Danby. It was published by Knight books in 1988. The tag line at the top of the book claims “Have the most Adventurous Year Ever…” which is an interesting title. I got my copy from a small second hand bookshop in Alton, Hampshire, for two pounds, so it wasn’t a bad buy. Its not something I had ever thought of owning. In fact I had thought that they were incredibly rare. Now I’m not so sure. There are a few copies on eBay, but not many, so maybe I picked up quite a gem. It’s a funny little book really, not like a proper diary. There are little boxes for you to write in, randomly spaced on the page, but the gaps are filled in with little notes about nature, jokes and contributions, apparently from the famous five. Danby includes little puzzles as well as the jokes. From what I’ve read they don’t seem very Blytonesque. Danby doesn’t seem to be very good at mimicking the style of Blyton. It may of course be the format doesn’t allow for much fluidity to get into the style, but any good writer who is taking on such well known works, should be able to work with whatever the format is. A sample of pages, taken from a lovely blog over at Vintagecobweb’s website. You may have heard the name Mary Danby before, and you would be correct in thinking that she has a Blyton connection. Danby is the author who wrote the “Famous Five and Me” books, where you got parts of a Blyton story, such as Adventuring Again, and then added different ‘paths’ into the stories and you have go pick the right way to go to find out the story. I only remember coming across these when I was about twelve or thirteen so I have only a hazy memory of them, but I can remember not being impressed (Which is odd because I did like one of the Claude Voilier books, The Famous Five and the Black Mask). So imagine my surprise when I realised that Danby had written other Blyton related things. 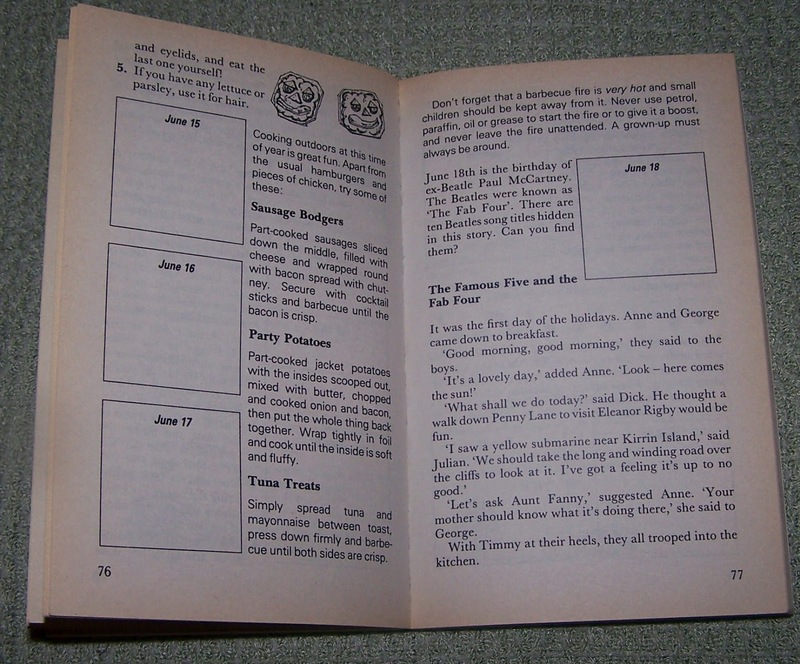 To give you an example of something that doesn’t feel very Blytonian is the passage that is on today’s date. It’s a strange fact to put in the book, I mean I conveys a sense of adventure but is it in keeping with a Famous Five diary? Another thing that comes with the diary is that there are a few extracts from the Claude Voilier novels, I can’t seem to find the right page now, but its only half a page worth of the opening passage. I am assuming that because these books are done by Knight, that Chorian didn’t give them publishing rights to print passages in the diary. It has a nice recipe for ginger beer in the October part of the diary, one of the few different recipes in the diary, though I’m not entirely sure that they are seasonal. I shall share the recipe for brewing your own ginger beer for those of you who wish to try. Take 300ml of tepid, 1 teaspoon of sugar and the yeast and mix them thoroughly in a large coffee jar. Every day for the next 7 days stir in ½ teaspoonful of ground ginger and 1 teaspoonful of sugar. Make sure that you use a wooden spoon for stirring- yeast hates metal! In between stirring, keep your jar upright and still and keep it covered with a piece of kitchen paper. Next strain the liquid from the solid mass at the bottom of the jar – DO NOT THROW THE SOLID MATERIAL AWAY! Use a nylon sieve for straining, not a metal one. This must be done very thoroughly as no solid matter must get through. You may have to strain it several times. Into a large saucepan put the juice from the lemons, 900g of sugar and 1 litre of water. Heat gently to dissolve the sugar but do not let the mixture boil. Add it to the strained ginger liquid plus another 2 litres of water. The ginger beer is now ready for bottling. Pour it into clean bottles and seal them with corks. NEVER USE SCREW TOPS! Pressure can build up inside the bottles and a cork will pop out, but bottles with screw tops can explode. Not only is this dangerous, it will make you very unpopular. Store the bottles somewhere dark and cool, like a garden shed, attic or cellar where nothing will get damaged by whizzing corks. Leave the ginger beer for at least 3 weeks before drinking. When you want to make some more ginger beer, put just half of the solid yeasty material into a clean jar and start again, adding the sugar and ginger every day for seven days. So there is the recipe for the diary’s ginger beer, if you do try it, please let me know how it turns out. I think I was lucky to come across it, and for a good cheap price, but I certainly wouldn’t have brought it for any more than two pounds. That is just my opinion, it’s a nice edition to my collection for sure. Do you have one? Do you like yours? Let us know! This entry was posted in Book reviews and tagged Claude Voilier, Ginger-beer, Mary Danby, The Famous Five, The Famous Five Diary. Bookmark the permalink. Thanks for the ginger beer recipe! The Black Mask was the only one of that series that I liked as well – great minds! Have a lovely holiday with Fiona – I am sure you will. Looking forward to seeing some of your (and Fiona’s) photos!